Wish you could complete your entire CSV file process in one place? Let's see how you can create and update CSVs through JMeter. Creating CSV files with Java through Apache JMeter is a convenient and easy way to form and to update your CSV files. Instead of creating the CSV file separately, you can complete your whole work process in one place — in JMeter. In this blog post, I will show you how to read and write CSV files through JMeter, and how to save data with them. This should be part of a longer test script you have, which uses the data from the CSV file for the load testing scenario. 2. Add an element that enables you to write a code in Java, i.e a BeanShell element. This can be a Sampler, PreProcessor or PostProcessor, according to your script needs. In this example, we will use a sampler. This is where you add the Java code with all the relevant parameters for the CSV file. The code executes writing to a CSV file with the variables in it. This is the code I used. This code writes the parameters that you set to a CSV file. Every time the sampler is executed, one more line is added to the CSV file. If you run this script a few times, “true” will append new lines to the file. To override the existing lines, change to “false”. This is an optional part of the code. 4. 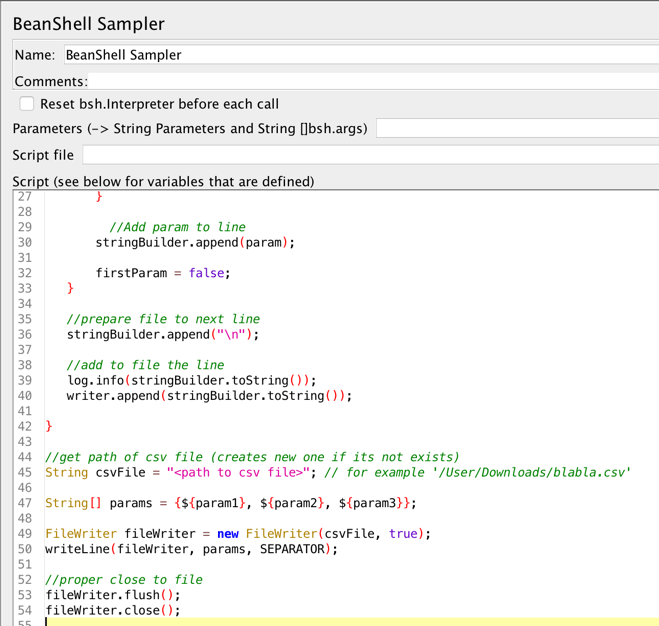 Add a BeanShell element that will read the entire CSV file and set each parameter to a variable so they can be used later on in the script. Here is an optional script for reading the entire file, you can create your own. The following line goes through each line in the CSV file and reads it. The following defines the array of the CSV line's params. The following part sets a new JMeter variable for each parameter in the line. You can define the parameters according to your needs and decide what to do with them in JMeter. That’s it! Now you can incorporate this configuration into your entire script, and integrate the CSV file reading and writing into your complete test flow. That’s it! You now know how to read and write data to CSV files through JMeter in Java. Published at DZone with permission of Michal Borenstein , DZone MVB. See the original article here.